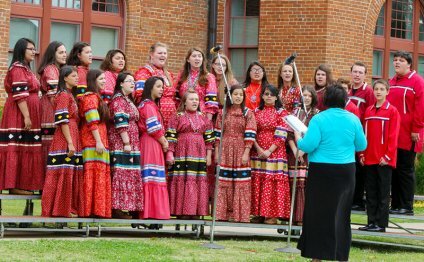 The OAKE National Conference Choirs is a high-quality performance program featured at the annual OAKE National Conference. Held in a different city each year, the National Conference brings together well-known clinicians, educators, conductors, and entertainment over the course of four days culminating in the Saturday performance of the students who have been selected to participate in the National Conference Choirs. Only active OAKE members are eligible to audition their students for participation in one of the four choirs, each of which is led by a nationally renowned conductor. The singers will learn and memorize their music at home with their own teachers before coming to the conference. Once they arrive, they will be immersed in an intensive rehearsal schedule leading up to the final performance featuring all four choirs. Children’s Choir – (SSA) – Treble singers in grades 4 – 5. Youth Choir – (SSAA) – Singers in grades 6 – 8 with unchanged voices. Concert Women’s Choir – (SSAA) – Female singers in grades 9 – 12. Chamber Ensemble – (SATB) – Male changed voices in grades 9 – 12, plus female singers selected from all the high school women applicants. Please note: these instructions are here as guidelines only. Instructions and materials are subject to change.